I see Campbell Harvey promoting the idea of Fedcoin here: "Bitcoin is Big. But Fedcoin is Bigger." I'm not sure I agree with his pitch for the idea. "Bitcoin and other cryptocurrencies are based on a complicated technology known as blockchain, which acts like a digital ledger of all transactions completed with the currency." Complicated? Well, yes and no. As I explain here "Why the blockchain should be familiar to you," there's a sense in which blockchain technology--a growing record of communal history existing on a distributed virtual ledger updated via a communal consensus algorithm--is an ancient innovation. Indeed, I claim that most of our small-group social interactions today still make extensive use of blockchain technology. Of course, the underlying mechanics of how Bitcoin works seems complicated to most people. But the same could be said of how electronic payments are executed today. A digital ledger of all transactions completed with the currency? Well, not exactly. Remember, there are always two sides to any transaction, with money flowing in one direction and something else flowing in the other. Bitcoin does not record what moves in the other direction. All that is recorded is the movement of bitcoin from wallet to wallet. The identity of who owns each particular wallet need not be visible. This is quite unlike the way digital money works in the banking system, where the identities of transacting parties are visible on proprietary ledgers. "It [blockchain] is somewhat similar to the serial number that you find on every dollar bill, but it actually means something because it makes bitcoin nearly impossible to counterfeit." The notion that a monetary unit in the blockchain can be thought of as a unique non-counterfeitable serial number is not a bad analogy. The analogy recognizes that the object of concern relates to the money itself (as is the case for physical cash) and not on the identity of who owns the money (as is the case for present-day bank-sector digital money). And so, when one speaks of central banks making use of "blockchain" technology, I presume that one means the issuance of digital bearer instruments and not just plain old digital money accounts (like what we already have today at www.treasurydirect.com). Unfortunately, Harvey never really defines what he means by Fedcoin. 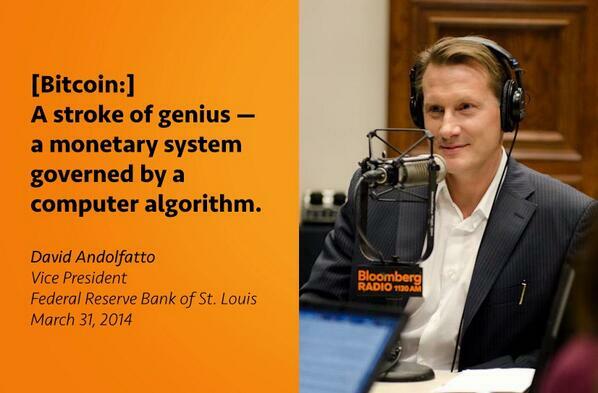 At times, I think he is talking about digital cash (digital bearer instruments secured on a blockchain). At other times, I think he's just talking about plain old central bank digital money being made available to the broader public. Harvey identifies the following benefits associated with Fedcoin: 1) Unlike physical cash, transactions would be visible; 2) it would permit a central bank to implement negative interest rate policies; 3) it would permit the implementation of helicopter cash. I'm not exactly sure what he imagines would be visible in a Fedcoin transaction. A lot depends on how the system is set up and whether the money exists as a digital bearer instrument or as plain digital money in an identifiable account. As for negative interest rate policy, yes it would be possible, though this would hardly serve as a panacea as far as monetary policy is concerned. Finally, helicopter cash is possible even today. The barrier here is not technological, it is political. "Fedcoin, by contrast, would be decentralized to various Federal Reserve banks. There would be central control over the money supply, just as we have today, but meanwhile, the technology would offer vast improvements in transaction efficiency. Digital transactions are quick, cheap and potentially a lot more secure than the system we have today." The technology (blockchain, I presume) would offer vast improvements in transaction efficiency? I confess that I simply cannot see what people are talking about when they say things like this. In my mind, there is nothing that can beat a centrally managed ledger (with backups) in terms of cost efficiency. Consensus record-keeping methods are inherently slower and more costly. There may be applications where these costs are worth bearing. But managing a central bank digital currency is not one of these applications. My writings on the subject of Bitcoin can be found here: Collected Works. It's true, I really did say that. It's Christmas time and I'm in a giving mood. So I thought I'd collect all my writings and talks related to Bitcoin and blockchain in one easy-to-access spot. Like many people, I first took notice of Bitcoin in 2013, after its price soared to over $1000, before plummeting significantly. Thank goodness I didn't buy any back then (D'oh!). Many economists dismissed the phenomenon as just another bubble/scam. This was my initial instinct as well, but after checking under the hood, I discovered something intriguing and worth learning more about. Bitcoin/blockchain is generally much better understood today than it was back then, although an air of mystery persists. But the concept is not very complicated at all, even if the underlying mechanics are. I liken this situation to how we understand machines. For example, most of us roughly understand how an internal combustion engine works, even if we don't know enough to build or repair one ourselves. Hopefully, you'll find some similar level intuition in my writings on the subject below. You may also find my posts and presentations of interest because I approach the subject from the perspective of an academic / central banker. I list my blog posts and talks on the subject below in chronological order (to monitor how my thinking evolves on the subject). Why Gold and Bitcoin Make Lousy Money. April 23, 2013. Link to blog post. Bitcoin and Beyond: The Possibilities and Pitfalls of Virtual Currencies. Dialogue with the Fed (a public lecture hosted by the Federal Reserve Bank of St. Louis), March 31, 2014. Slide deck. Link to presentation. The Virtual Currency Revolution. Opening address at the DATA annual meeting, April 10, 2014. Link to presentation. Cryptocurrencies: Bitcoin and Beyond. SFU Vancouver Speakers Series, July 7, 2014. Link to presentation. Bitcoin and Beyond: The Possibilities and Pitfalls of Virtual Currency. Federal Reserve Bank of Atlanta, Jacksonville Branch, November 16, 2014. Updated slide deck. Bitcoiners: Surely We Can Do Buiter Than This? November 27, 2014. Link to blog post. Money and Payments, or How We Move Marbles. February 1, 2015. Link to blog post. Fedcoin: On the Desirability of a Government Cryptocurrency. International Workshop on P2P Financial Systems, Frankfurt, February, 2015. Link to presentation. Link to related blog post. Bitcoin: A Decentralized Public-Legder Digital-Asset-Transfer Mechanism. Bendheim Lecture, Princeton University, May 1, 2015. Link to presentation. Fedcoin and the Implications of Cryptocurrencies Issued by Central Banks. June 15, 2015. Link to podcast. Bitcoin and Central Banking. November 12, 2015. Link to blog post. Is Bitcoin a Safe Asset? March 27, 2016. Link to blog post. Monetary Policy Implications of Blockchain Technology. May 1, 2016. Link to blog post. Why the Blockchain Should Be Familiar to You, May 5, 2016. Link to blog post. Can the Blockchain Kill Fake News? December 30, 2016. Link to blog post. Tyler Cowen on Central Bank Cryptocurrencies. November 27, 2017. Link to blog post. There's still much more I'd like to write about. I find what's happening with BTC fees rather interesting. Somewhere in one of my talks above I speculated that in the long-run, the fees miners charge were likely to rise to Visa and Mastercard rates. It looks like we're well beyond that now, but is this temporary or likely to persist? The price dynamics right now are astounding, of course. But remember that the success or failure of the Bitcoin Project does not depend on the market price of BTC (as long as it stays above zero). The potential revolution here is in record-keeping. Who knew that accounting might offer so much fun and excitement? Fedcoin and Blockchain. December 27, 2017. Link to blog post. Blockchain: What it is, what it does, and why you probably don't need one. January 21, 2018. Link to blog post. Bitcoin: Beyond the Basics. Timely Topics, St. Louis Fed. Link to podcast (16 minutes). Blockchain, Cryptocurrencies and Central Banks, Dialogue with the Fed, August 29, 2018. Link to presentation. Smart Contracts and Asset Tokenization. November 8, 2018. Link to blog post. 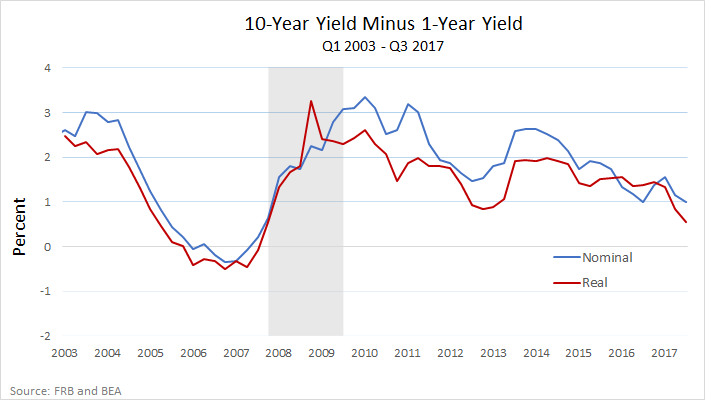 There's been a lot of talk lately about the flattening of the yield curve, what's causing it, and what it portends. In this post, I describe a simple "neoclassical" theory of the yield curve and ask to what extent it serves as a useful guide for our thinking on the matter. Let's start by defining terms. 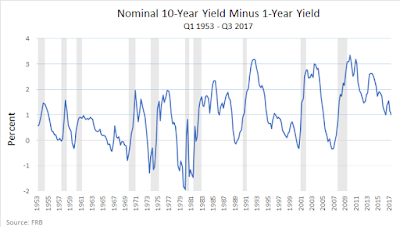 Let I(m) denote the yield (market interest rate) on (say) a U.S. treasury bond with maturity m. So, I(1) denotes the yield on a one-year bond and I(10) denotes the yield on a ten-year bond. The slope (S) of the yield curve is given by the difference in yields between long and short bonds. In this example, S = I(10) - I(1). Here's what the yield curve looks like for the U.S. since 1961. Normally, the slope of the yield curve is positive. But occasionally, it turns negative -- an event that is called yield curve inversion. Market analysts care about yield curve inversion because the event is frequently (though not always) followed by a recession (the shaded bars represent recessionary episodes). Let me now explain in words what this model implies. First, the model predicts that real interest rates are proportional to expected economic growth. The economic intuition for this is that if incomes are expected to grow more rapidly, then in an attempt to smooth consumption (that is, bring future income back to the present) people will want to save less (or borrow more). The decline in desired saving (increase in desired borrowing) results in upward pressure on the interest rate until the bond market clears. The slope of the yield curve in this model economy is given by S = R13 - R12. This is roughly the ratio of expected long-term growth (y3/y1) relative to expected short-term growth (y2/y1). Thus, a positively-sloped yield curve in this economy is symptomatic of a bullish economic outlook (growth is expected to accelerate). Conversely, a negatively-sloped yield curve is symptomatic of a bearish outlook (growth is expected to decelerate). The interpretation offered here of the flattening yield curve is that expectations are turning increasingly bearish--people are cutting back on planned consumption, increasing their desired saving (reducing planned borrowing)--all of which serves to put downward pressure on long rates. As with all simple theories, it would be wrong to view this as "the" explanation for the yield curve. At best what the theory does is highlight certain forces that may be at work in the real economy. Whether the forces identified are quantitatively important is an empirical question. Nevertheless, I think the model offers a good place to organize our thinking on the matter. A conventional view among economists is that the Fed has little or no control over long real interest rates. If long-rates are declining because of an increasingly bearish sentiment, then there's little the Fed can do about it. But what justifies the recent policy of raising the short-term rate? The model above suggests that the Fed is simply responding to market forces--the market "wants" higher short rates and the Fed is simply accommodating this want. I'm not sure this is the best way to think about what's happening. One thing missing from this simple model that may be important to consider is the liquidity premium on short-term government debt. Is the current Fed policy affecting this liquidity premium and, if so, what effect is it having on real economic activity? I'll try to address these and other questions in future posts. In reality, the yield curve is usually positively sloped. It seems unlikely that the explanation for this is that investors are perennially bullish (in the sense of expecting accelerated growth). There are other factors that may impinge on bond yields at different horizons and hence on the slope of the yield curve. One such factor is the liquidity premium attached to short-maturity debt. If the short bond in the model above is valued for its liquidity (and if liquidity is "scarce" in a well-defined sense that I don't have room to explain here), then the market yield of the short bond will be lower than what is dictated by "fundamentals." In other words, short bonds will seem very expensive. 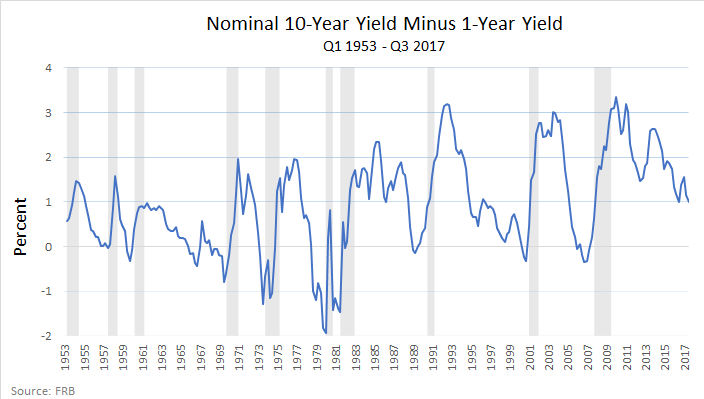 If this is the case, then the yield curve may be positively sloped even if the growth outlook is stable (instead of bullish). To the extent that the Fed can influence the liquidity premium on bonds (and there is good reason to believe it can), then raising the policy rate in the present environment would serve to diminish the liquidity premium on bonds. In the model economies I know of where such a liquidity premium exists, eliminating it actually stimulates economic activity. This is because liquid bonds, to the extent they are used as exchange media, actually complement investment spending instead of crowding it out (as is the case in other models that abstract from the liquidity services that bonds provide). The interpretation in this case is that raising the policy rate is reducing "financial repression," which is likely to offer modest stimulus. This policy action in itself will have no measurable impact on inflation and the associated flattening of the yield curve is what we would expect if growth prospects remain stable (the flattening yield curve does not necessarily portend recession).